If you've not been following the involvement of the International Monetary Fund and the World Bank in the failing fortunes of the many countries that make up the African content, then I'd certainly advise you to do so. It's a grim story of exploitation and almost criminal economic advantage-taking wrapped in the deceptively friendly glove of financial support – loans were granted to the world's poorest nations by the richest, but with the sort of strings attached that seem designed to exploit the recipients as a source of cheap labour and goods, with forced privatisation paving the way for foreign multinationals to undercut local businesses with their own subsidised imports. If this were not enough, many of the countries have had to spend a far larger portion of their GNP on loan repayments than on health care, which has been cited as a key contributor to the continent's AIDS explosion. It's this socio-economic issue that's at the heart of Abderrahmane Sissako's Bamako, an unusual but elegantly handled blend of factual evidence and drama. In the Mali capital of Bamako, the relationship between bar room singer Melé (Aïssa Maïga) and her unemployed husband Chaka (Tiécoura Traoré) has become strained. As the pair go about their daily life, barely communicating with each other, the courtyard of their house becomes host to legal proceedings in which the International Monetary Fund and the World Bank are being prosecuted for the harm their policies have inflicted on Africa, with witnesses called to give evidence and answer interrogation from both councils. Now on paper I have no doubt that this sounds worthy but cinematically a little dreary and even monotonous, and even as someone who strongly supports the views being expressed here I went in wondering whether this could actually work as cinema. But from its earliest moments there is a gentle poetry to the handling, and it soon becomes evident that Bamako is going to be much more than a platform for political rhetoric. The trial itself is slow to get under way and at first appears to be taking place on a different plane of existence to the everyday activities that surround it. The locals indifferently go about their business and although the proceedings are being conducted in her own courtyard, Melé walks through it and the assembled group without either party acknowledging the presence of the other. Only the man guarding the entrance to the yard appears to be initially aware of both worlds, greeting Melé as she leaves and controlling access to the court. He warns a camcorder-wielding reporter that no filming is allowed, but professional cameras and mike booms are openly in attendance – it's never certain whether these are the instruments of a televised broadcast or Sissako's own crew, revealed in a further peeling back of film reality. Such structural game-playing is always more than surface surrealism and is clearly designed as a commentary on the relationship that the average citizen has with decisions of state and international politics. Initially unresponsive to the proceedings, the townspeople begin to pay more attention when the arguments heat up and the stories become more personal. But it doesn't last. Indifference once again sets in, and the loudspeakers over which the trial is being broadcast are disconnected by locals so that conversations about more trivial matters can continue undisturbed. The location of the hearing also has an equalising effect, rightly suggesting that the lives of ordinary citizens are as significant and worthy of our attention as the debates of the even highest court, something the judge here acknowledges with the announcement that there will be "an adjournment for social realities" to let a wedding party pass through. The quietly deteriorating relationship between Melé and Chaka also has its allegorical aspect, and even the most offhand moments can double as social commentary: the unhelpful imported religions; the reporter who bribes the gate keeper to gain access to the trial; the man who is learning Hebrew to be a guard at an Israeli embassy that there are no current plans to build; the well-to-do defence attorney who demands to see the logo that proves the sunglasses he is buying from a street vendor are genuine Gucci. At the core, of course, is the case against the IMF and the World Bank, which is passionately and persuasively made, the dramatic structure of the film allowing an anger that would feel overly didactic in a straight documentary. 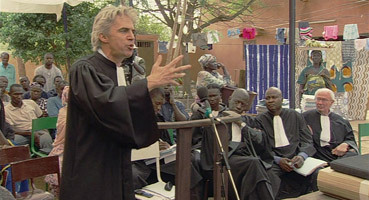 The facts and figures presented are damning in themselves and the indignation of the witnesses clearly comes from the heart – unlike the main players and even many of the background characters, they are clearly not professional actors but Malian citizens with experience-formed views and their own stories to tell. The case is intelligently and forcefully argued by council and witnesses alike, but somehow the most powerfully affecting moment is also the least specific, as an old man sings in a voice filled with a sadness and anger, in a dialect that neither we nor the court members understand (there are no subtitles for this sequence), but whose effect is to move us as profoundly as it does the assembled group. 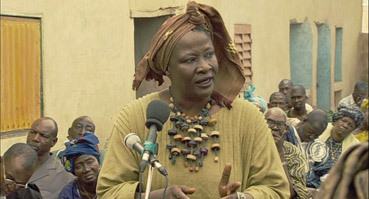 Bamako is impassioned but well argued political cinema that also succeeds in artistic and dramatic terms. It's typical of the best recent African cinema in that it grips without ever feeling the need to hurry and makes even its most inspired moments seem unforced. 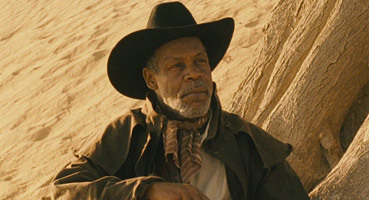 Only the mid-film American Western parody, complete with title and credits and starring co-executive producer Danny Glover and directors Elia Suleiman, Zeka Laplaine, Jean-Henri Roger and Sissako himself, feels a little heavy-handed in its allegory. But in all other aspects Bamako strikes a most effective balance between subtle suggestion and direct confrontation, with the anger of the witnesses and prosecutors both understandable and appropriate. If you are familiar with the politics of African poverty then Bamako still has plenty to offer in its drama, its focus on the detail of everyday lives, and its infectious sense of international solidarity. If, on the other hand, you are looking to expand your understanding of an issue that despite affecting an entire continent just never seems to make the headlines, then this is a solid and heartfelt place to start. Framed 1.85:1 and anamorphically enhanced, this is a fine transfer whose sharpness is free of obvious edge enhancement and whose colours, which are vivid when they need to be (fabric drying is a prominent background activity), are bright but natural and do not feel artificially saturated. Even at night the detail is clearly visible and the blacks here are absolutely solid. Whether Bamako was shot on film or Hi-Def I've been unable to confirm, but the latter would account for the rare white-outs on the some brighter spots in some shots. The occasional hazy look is due to a combination of light, dust and insects and was also that way on the film print. Both Dolby 2.0 stereo and 5.1 surround are available but there's little to choose between them. Both offer clear, full bodied reproduction of dialogue – there's not much in the way of incidental music and the sound effects, with one deliberately jarring exception, are largely consigned to the background. The song sung by Melé that bookends the film sounds particularly good on both tracks. Becoming a standard but always welcome feature of Artificial Eye discs is a half-hour interview with the director, and this one with Abderrahmane Sissako covers some typically useful ground, including Sissako's early life and film education at the Soviet Union at the Gerasimov Institute of Cinematography, at which Sergei Eisenstein and Vsevolod Pudovkin once taught and whose previous students include Sergei Bondarchuk, Andrei Tarkovsky and Aleksandr Sokurov. He also discusses the film's structure, intentions and casting, the western sequence and the difficulty in distributing the film on home turf. The Hollywood actor and co-executive producer of this film talks about working with a director he greatly admires, and becomes infectiously passionate about the issues the film confronts. Pete Postlethwaite, Adjoa Andoh and Ronan Keating outline the problems created for poor countries by IMF and World Bank in a level-headed appeal for action. A good sell that nonetheless suggests a faster paced film than you get. A rolling gallery of film stills displayed within the angled framework of the menu design and of little real interest when you have the feature to look at. A textual feature in which Abderrahmane Sissako outlines the political situation that provided his motivations for making the film. There's also a brief Abderrahmane Sissako Filmography. A bold and effective approach to political filmmaking that is nevertheless unlikely to work for everybody – we lost one patron from our cinema screening just half-an-hour in. But it deserves to be seen and its message appreciated, understood and, in an ideal world, acted on. There are a number of sites where you can find more information on the issues raised in the film: The Africa Action and Global Issues sites should get you started. Another fine DVD from Artificial Eye that compliments the film with a very reasonable package of extra features.